Here are the Four Universal Rules. These rules always apply, every time we handle a firearm — no matter who we are, no matter where we are, and no matter what we intend to do with the gun when we pick it up. To safely show unsafe behavior, we disable the gun rather than simply unload it. Here, a Training Barrel from Blade Tech replaces the gun’s barrel, making it impossible to load or fire. Lt. Col. Jeff Cooper, the founder of Gunsite, deserves a great deal of credit for being the first to popularize the need for truly universal safety rules that would apply to all firearms at all times — including those kept loaded for personal defense. Adapting concepts he’d learned in the military, Cooper boiled down all of the various rules about firearms into simple ideas that could be expressed in just four rules. The rules are simple enough that even a child can understand them, and provide a completely interlocking safety system that works well for people who live with firearms as defensive tools. You might not think that’s a big deal, but there’s a lot of genius that went into these four simple rules. Complexity is easy; simplicity is difficult. Why are there four rules, instead of only one? Because each one of the four rules provides one layer of safety. If we break only one rule, the chances are that no one will be harmed. We’d have to break at least two of the rules in order to hurt or kill anyone unintentionally. This rule means that we must always treat every firearm with the same respect we would give a loaded weapon. When we follow Rule One, even after we have just checked to see that the gun is unloaded, we still never do anything with it that we would not do with a loaded gun. This is the cardinal rule, and all other safety rules follow naturally from it. At its heart, Rule One means that the other safety rules will always apply. It means we carefully protect our good habits, and never excuse our bad ones. Some people apparently believe that merely checking to see the gun is unloaded means they can then treat it like a toy — that they can point it at their friends to pose for a picture, or at their training partners for disarming practice, or at a flimsy interior wall for dryfire, or at their own left hands to check trigger function. That’s a foolish, foolish idea that kills a certain number of people every single year. This rule simply states the first and most logical consequence of Rule One. A commonly-seen violation of Rule Two puts the left hand in the line of fire. No matter what we are doing with the firearm — whether we are unloading it, cleaning it, or showing it to a friend — we never allow the muzzle to point at anything we do not want a hole in, nor at anyone we are not willing to kill. 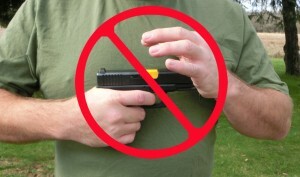 Rule Two means we always stay very aware of muzzle direction during the entire time we’re handling the gun. If we must pick the gun up or put it down, we must notice where the muzzle is pointed from the very moment when we first touch the gun until the moment when we finally let go of it. If we cannot pick the gun up without allowing it to point at something that shouldn’t be shot, we should not pick it up. If we cannot put the gun down without allowing it to point at something that shouldn’t be shot, we should not put it down. Whenever we handle a firearm, we can think of it as a Star Wars light saber: anything it crosses will be cut in half. It should take a conscious effort to put a finger on the trigger. A good shooter never, ever, ever finds one of their fingers resting on the trigger or within the trigger guard when they didn’t consciously and deliberately put it there. When we take our fingers off the trigger, we index it high on the frame of the gun, not just alongside the trigger guard. What is a target? A target is anywhere we deliberately point the weapon. It a place that we’re absolutely certain we would not mind sending a bullet. Whenever we are not deliberately pointing the weapon at the optimal spot for a bullet to land, we must keep our fingers away from the trigger and high on the frame of the gun. It is that simple. 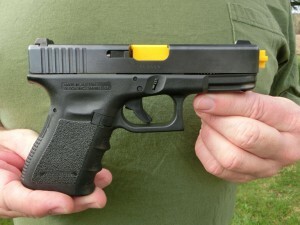 It follows that in order to clean a firearm such as a Glock, which requires the user to pull the trigger when disassembling the gun, we must have a safe target with an adequate backstop at home. At the very least, we must choose a spot on the floor: someplace we have deliberately chosen as the optimal spot to put a bullet. Under no circumstances would we point the gun in a random direction during the disassembly process, and especially not at any portion of our own bodies. When we do not have a decent spot to deliberately point the gun, with an adequate backstop, we simply do not put our finger on the trigger. This is true no matter what kind of gun we have and no matter what we intend to happen when the trigger is pulled. This rule sounds deceptively simple, but it covers a world of potential tragedies. Among other things, it means we always identify our intended target, and that we must carefully consider the backstop — or lack of a backstop — beyond it. Hunters must always visually identify the game they are shooting. It is not enough to merely hear a noise, or see a quick flash of motion or color. We must see enough of the animal to positively identify it as both legal and safe to shoot. 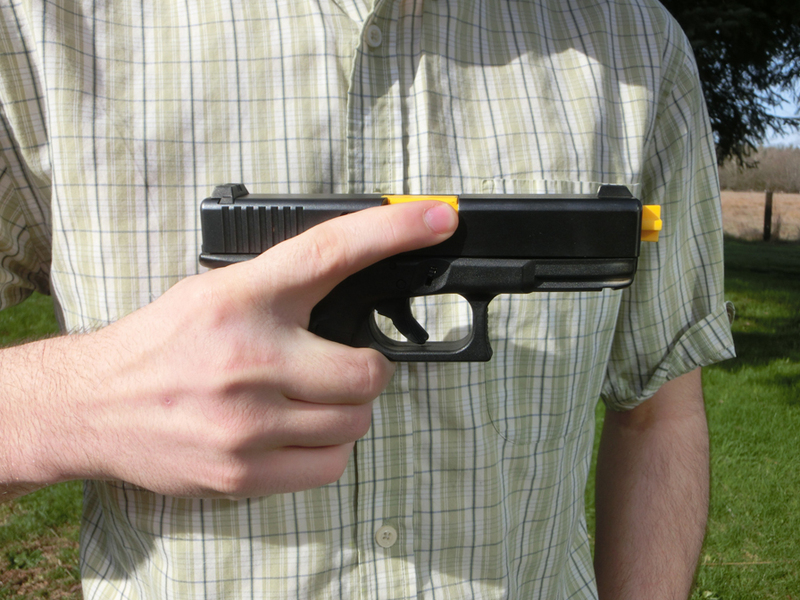 Placing the finger high on the gun’s frame, at the natural limit of movement, helps prevent it from clenching the trigger if the shooter slips and falls. When shooting at the range, we must never begin firing until we are absolutely sure that no one is lurking behind or around the targets. It isn’t enough to simply hear someone call the range clear. When we’re the ones holding the gun, we must look for ourselves. Every shooter is responsible for where their own bullets land, and that’s why we look for ourselves. For concealed carry permit holders, this becomes even more critical. With such high stakes, we must be overwhelming sure of the circumstances before we pull a gun in public. If we are not overwhelmingly certain that the person we intend to shoot is an immediate, deadly threat to an innocent person, then we know that the gun is not the correct solution to the problem. Rule Four also means that every time we fire a gun in practice, we must have an adequate backstop that will stop a bullet. When we practice dry firing, we must have a safe backstop at home. On an outdoor range, we never allow the muzzle of the firearm to point above the berms which are designed to contain the bullets. What is an adequate backstop? It depends upon the type and power of the firearm we are shooting. A shotgun loaded with birdshot, for example, requires only a long stretch of open air before the pellets will come harmlessly to rest. But rounds from a hunting rifle can literally travel miles if they are not stopped by hitting something very solid. When we use a gun “for keeps,” as in hunting or self-defense, it may not be possible to have a solid backstop as we would on the range. Nevertheless, we must always be conscious of where our bullets will land. For self-defense, when there is an innocent standing directly behind the target, we should either hold fire or reposition ourselves so that the innocent is no longer in the line of fire. We must weigh the deadly threat from the attacker on one hand against the deadly threat from our own bullets on the other hand. Whenever we handle guns, we know that we will be called to account for every round we fire, not just the ones we intended to shoot. We know we are responsible for every bullet that leaves our guns, not just those that hit the intended target. That’s why we guard our good habits every time we handle a gun, and that’s why we always follow the Four Rules.